Birds in the banana trees outside my window served as my alarm clock. Breakfast was in the main dining hall and consisted of a hard-boiled brown egg, croissant type rolls, sliced tomatoes and cheese and of course, olives. The coffee was quite excellent and I admit to lingering over several cups. After breakfast, we met in the patio for a brief discussion and review of different painting techniques. I haven’t picked up a brush except to paste wall paper for several months—and my intentions to spend some time drawing remained just that. Our assignment for the morning was to find an interesting spot in the hotel to paint—and to primarily focus on sketching—not a full-size complete painting. We walked through the market to our luncheon site—an outdoor café where we had chicken tajine or beef shish-kebobs and very American looking French fries followed by coffee or mint tea. The method of serving mint tea here is to pour the hot water from a very high level into the small glass and then pour that water back into the pot. We lingered waiting for the day to cool off a bit—although it is hot here, it is not very humid—so I find it rather pleasant—the others find the heat rather oppressive. After lunch we wander through the market place. There are many sandal/slipper makers—with all sizes and all sorts of styles and colors. The jewelers display lovely filigreed items of many sorts—belts, earrings, bracelets. The robes are particularly attractive—so many lovely colors and unusual color combinations. Some of the robes are displayed on blue-eyed, blonde carefully coifed plastic mannequins—most likely French and quite old. Some of the robes have a hundred or more tiny hand-made buttons—twirled-braided –down the front of the robe. The custom is for the woman to buy the robe and then weave silken ribbons through the front to personalize it. We stop to talk to a sculptor—who selects his own stone from many miles away—taking two or more days by donkey to carry the stones to a place where a cart can pick them up and bring them to his work-place. Then he works with various tools—hand-driven drills to carve out turtles, camels, masks, and abstract figures suggestive of robed Bedouins or Arabs or Berbers. Our next assignment is to sit about the orange juice seller square and do more sketching. I do a bit but am more interested in Mustafa’s discussion about his country—and trying to pick out the different nationalities by their clothing. I see all sorts of variation in dress—the jellaba which is a hooded caftan garment—tasseled for the girls, non for the boys; totally black scarves and skirts and veiled (Bedouin), to brightly colored head-scarves only over European dress, beautiful blue scarved/skirted women with a black face veil, to totally American dress with blue jean shorts and shirts. Men wear shirts with shorts or pants, thick cotton sweaters, brown hooded c aftans, blue hooded caftans, some wear fez—most are white with intricate designs embroidered on them, and some wear stocking caps with a point on the top. I walked back to the hotel with the instructor, stopping on the way back at a roof-top café for a panache—–French for mixed up—a drink of banana and citrus—quite nice—but of a green color suggesting avocado. The photographers were all busy practicing panning movement while their instructor guarded their tripods. Supper was in a moonlit garden patio of a quite lovely hotel about ten minutes away from our hotel. I shared a bottle of red wine with one of the painters; I was surprised when all the English knew the words to the Beverly Hillbillies television show, were familiar with Davy Crocket (and the TV song), plus the Dukes of Hazard. Probably the four bottles of wine split amongst six people had something to do with the singing much to the amusement of the others. Hot sweet mint tea ended the meal and we journeyed back to our hotel via taxi. 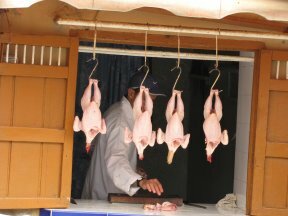 Tomorrow we tour more of Taroudant and see a tannery. Perhaps I’ll be brave enough to break out my paint.